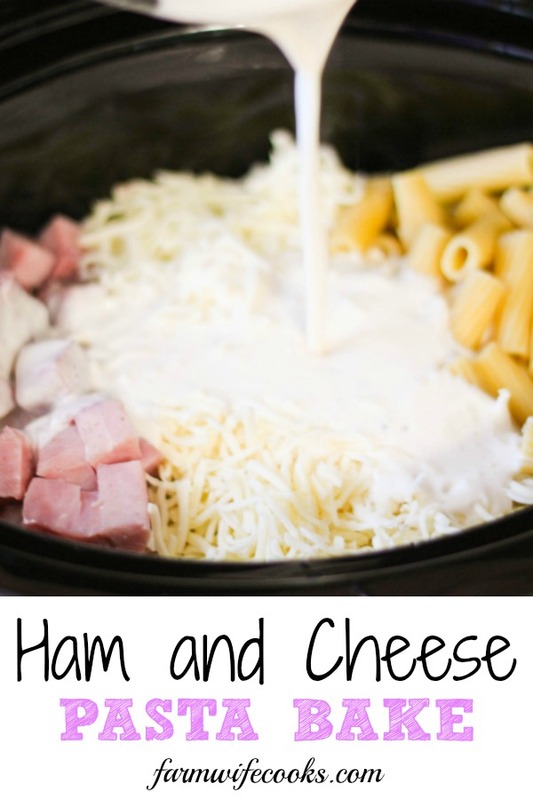 Are you looking for an easy crock pot meal? 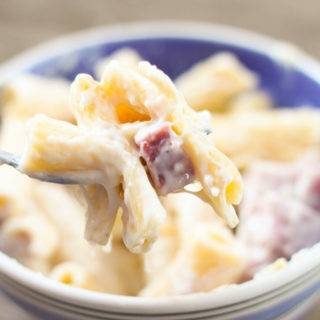 This Ham and Cheese Pasta Bake is the perfect, kid-friendly weeknight meal! 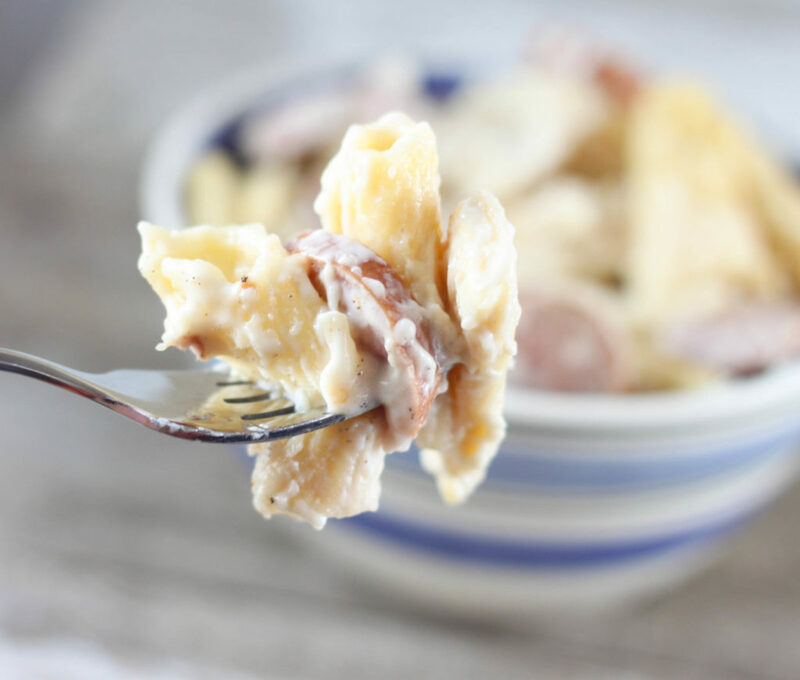 If you like this recipe be sure to check out the Smoked Sausage version. 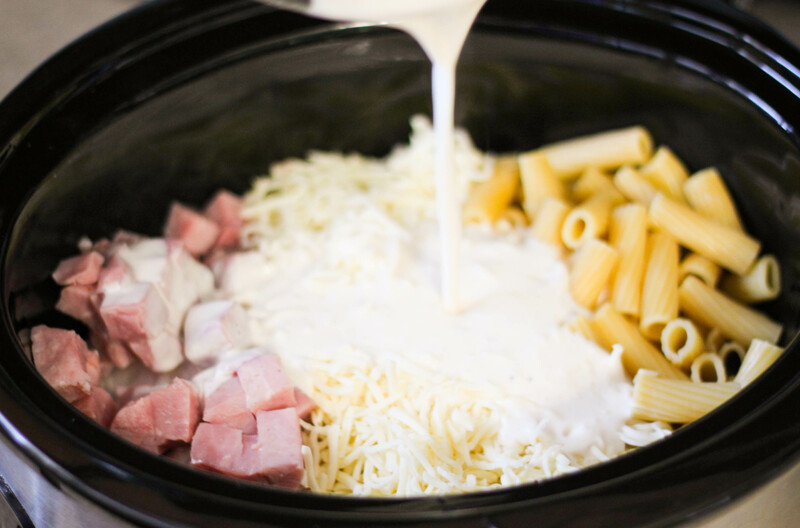 I love all day slow cooker meals, the ones where you toss all the ingredients in the crock pot in the morning and then dinner is ready when you come home. But every now and then I need something quick. 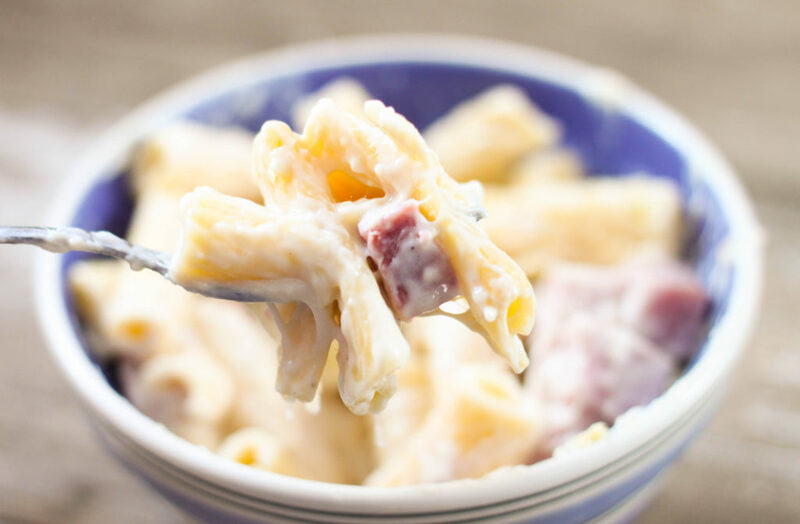 This recipe is perfect for those nights when you need to toss something together and then run to dance or basketball practice and come home with a house full of hungry people. All the ingredients are basically pre-cooked so all you need to do is warm them all up. 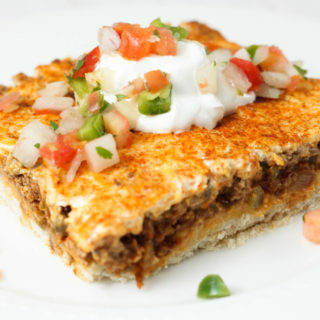 This recipe could be made on the stove, in the oven or as the recipes card shows in the crock pot. If you are making on the stove cook the noodles according to package directions. 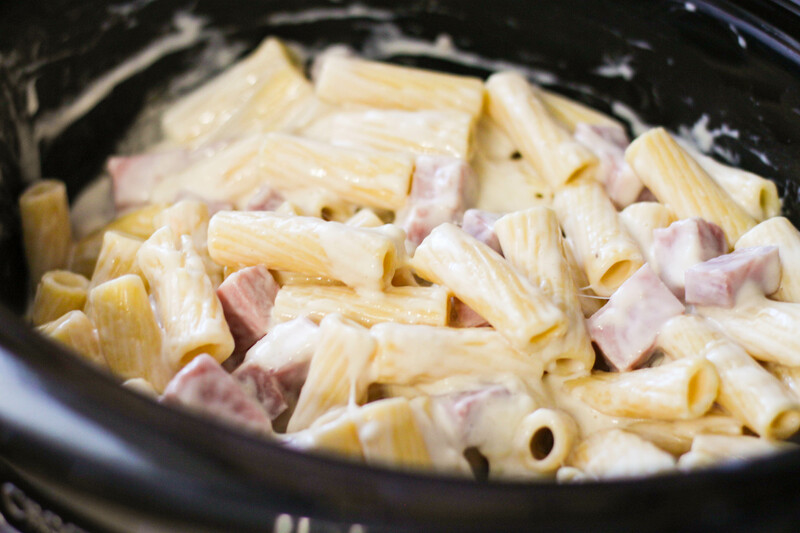 The reason for cooking the pasta al dente when using the slow cooker is because the pasta will continue to cook in the crock pot. Half-and-half is a mixture of cream and milk. If you don’t have half-and-half you could use milk but I would recommend whole or 2%. If you wanted to make this more of a complete meal you could add peas the last 30 minutes of cooking or serve with a salad. I used packaged cubed ham but you could also use leftover ham or a ham steak. Fill saucepan with water and bring to a boil. Add pasta and cook for 7 minutes. Drain pasta and transfer to a 5 or 6 quart slow cooker. Add remaining ingredients and cook on low for 3 hours or on high for 1.5 to 2 hours or until warm throughout and cheese has melted. It’s just me in the house and I do a lot of meal planning (aka: extras go in the freezer). Does this freeze well? I am not sure how that would turn out. I would be worried about the noodles. It might be better to make half of the recipes. Can I use any other meat, I don’t eat pork? Hi there, yes the sauce has an Alfredo base so chicken would be good too! 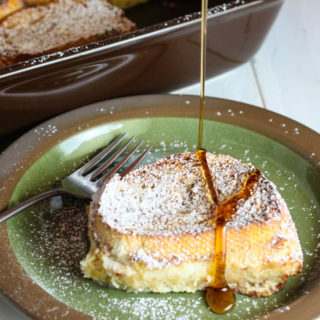 Has anyone tried to make this. You could just warm everything on the stove top or you could mix it all together and bake in the oven at 350 degrees until heated through. Yes you can use different types of pasta. Just watch how long you cook them so they don’t get mushy. I have never tried it with anything other than Alfredo but there are a lot of different flavored Alfredo options that would be yummy. Easy and cheesy! Sounds good to me! Thanks for sharing on the National Pork Month Celebrate 365 Blog Party. It could easily serve 6 people or more if served with a side salad, etc. There are 4 of us and we get two meals out of it. Hope you enjoy!